The chart above shows monthly unemployment rates from: a) January 1931 to December 1940 (120 months) and b) January 2007 to August 2010. We hear a lot of comparisons between the recent recession and the Great Depression, and the chart above shows that those comparisons are hugely exaggerated. 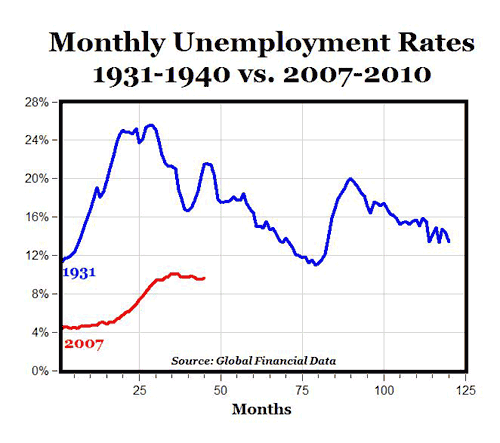 Consider the fact that there were 127 consecutive months of double-digit unemployment rates between November 1930 and May 1941, and 21 consecutive months with unemployment above 20% from April 1932 to December 1933, with a maximum of 25.6% in May of 1933. Then compare that to the recent recession, where there were only three consecutive months of double-digit unemployment rates, with a maximum rate of 10.1% in October 2009. Bottom Line: As bad as the recent recession might have been, it was never anywhere close to the disastrous economic conditions of the 1930s.